On Thurday, EESL project head Randhir Singh releases the Complaint Number on which you can call to register your complaint, if you found a damaged Street Vapour Light near you. Note that from Thursday Energy efficiency service limited company starts the work to repair street Vapour LED Light which they assemble back in 2018 in Muzaffarpur. 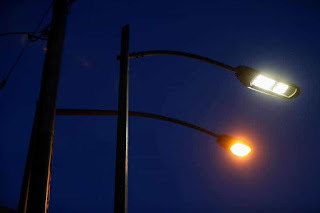 To initiate the process, more quickly they even releases a complaint number where one can register about a faulty or damaged street LED Vapour light. Note that the tender to assemble LED Vapour street light in Muzaffarpur is given to EESL back in 2018. However, after several month many street lights are found to be damaged. On Thurday, EESL project head Randhir Singh releases the Complaint Number on which you can call to register your complaint, if you found a damaged Street Vapour Light near you.